First 737 MAX unveiled at Renton plant. First 737 MAX rolls out at Renton plant. Boeing’s highly-efficient Renton plant has been manufacturing 42 jets per month. 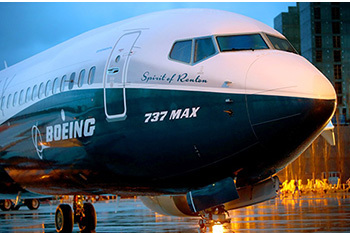 With the addition of a third production line for the brand new 737 MAX the numbers will rise to 52 or more per month. Washington State aerospace employees have over a century of know-how. Couple that with a robust supply chain, a responsive worker training system and a depth of experience in advanced manufacturing, Washington sets the standard for aerospace innovation and efficiency. Read more in The Seattle Times. Washington State has over 1,350 aerospace-related companies, including 800 in the Puget Sound Region. Over 132,500 highly-skilled workers are employed in the aerospace sector with 24 community and technical colleges offering aerospace-supportive training programs. Resources such as the Center of Excellence for Aerospace and Advanced Manufacturing assist industry leaders in meeting their employment, production and growth needs.